With the locus of Brexit-related squabbling drifting back toward the Continent this week, it's important to remember that Spain's threats about opposing the Brexit plan over Gibraltar (and France, the Netherlands and Belgium's threats about opposing it over access to UK fisheries) are only a temporary distraction. The EU doesn't need unanimity to approve the final Brexit treaty and accompanying 'political statement' (though the EU parliament will need to approve the deal after the UK, and any final trade deal reached at the end of the post-Brexit transition period would require unanimous approval by the member states), and while the EU has placed tremendous emphasis on presenting a united front, it's doubtful that the negotiators and sherpas who have put so much effort into hammering out the current 580+ page draft deal (and the accompanying 26 page framework for negotiations on a post-Brexit trade relationship) would let all of that work go to waste. According to the most recent batch of media reports surrounding the negotiations, the fisheries issue has been resolved (though the details haven't been released). And it's still unclear whether the deal struck by Europe will be accepted by Scottish Tories who have already sent one letter threatening to sabotage the whole thing if the UK doesn't commit to blocking European fishermen from Scottish fisheries. 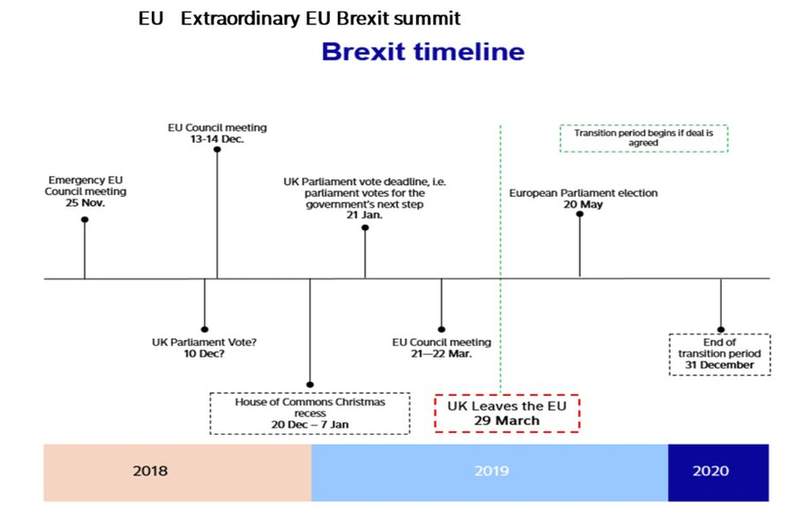 But assuming the Brexit plan is finalized on Sunday at the planned weekend summit, on Monday, the focus will almost certainly shift back toward Theresa May and her increasingly fraught relationship with Brexiteers within her own party. May's internal opposition is already near the threshold needed to force a leadership challenge within the conservative party. Most of their objections are related to the wording of the 'Irish backstop', which has caused a lot of trouble for a piece of the agreement that's designed to, under ideal circumstances, never come into effect. According to the current terms, if no deal is reached, the UK would remain in a customs union with the EU until both sides sign off. That, according to the Brexiteers, would risk leaving the UK stuck as a "vassal state" under the thumb of a possibly vengeful EU. And with the March 29 'Brexit Day' looming ever closer, May is quickly running out of options (even her attempt to win Tories over with the so-called "fantasy unicorn" option of possibly replacing the backstop with a commitment to leverage technology that hasn't even been invented yet to prevent a hard border on the island of Ireland failed to placate her Brexiteer colleauges). The EU, for its part, has said it is done negotiating, and it's unclear what, if anything (aside from an imminent no-deal Brexit), could entice them to return to the table. To that end, Bloomberg has created a handy guide, which we have augmented with some additional commentary and charts. 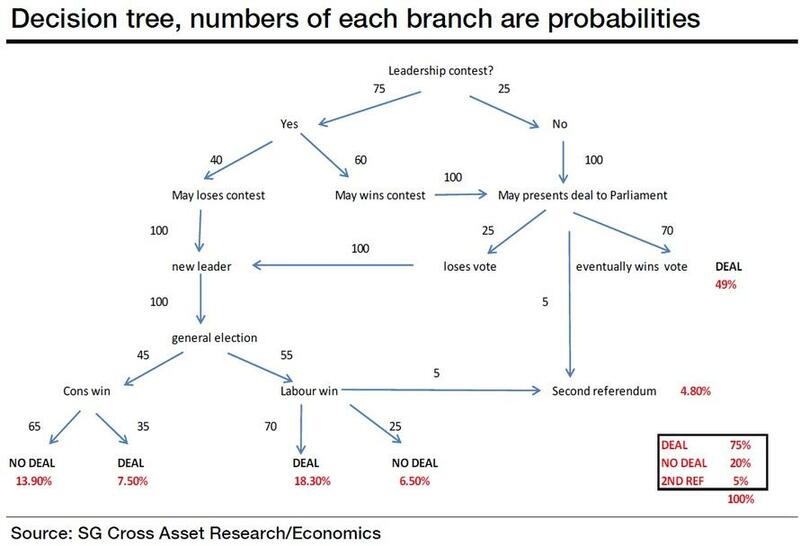 Here are some of the most probable outcomes assuming May can't get the draft Brexit plan passed during a vote expected next month. By now, anybody who has been paying attention to the increasingly tedious Brexit drama probably understands that the only person who believes that the draft plan can pass Parliament is the prime minister. If she brings it up for a vote in the House of Commons next month, she will probably lose. If she does, she could wait for what many expect will be an "adverse market reaction" to effectively threaten her rebellious Tory colleagues into falling in line (in a scenario that has been compared with the passage of the TARP package in the US back in 2008). May's line would be: The EU has closed the door on future talks. This is the deal. It's not changing. It's this, or a "no deal" Brexit that would risk total unmitigated chaos. However, a plan that's so totally dependent on an adverse market reaction could be thwarted by markets just as easily. The problem with the whole TARP/Brexit thing is that expectations are difficult. If people believe voting against the deal will cause the pound to drop, and people in markets think that will cause the deal to pass the second time, then the pound won't drop in the first place. Parliament has sent a message: This doesn't work for us, we want more. So May goes back to Brussels, hat in hand, and asks for more. It's possible Brussels could try and sweeten the deal. But the likelihood that a dramatic change surrounding the backstop can be made is low. She's had enough. So much for the "national interest", May has given this thing her all, and has decided to quit while she's ahead. The Tories would hold an instant leadership election. Whoever wins would be faced with much the same options. May has said she has no intention of resigning. As a reminder, here's a chart showing the most popular politicians in the UK (courtesy of Statista). Rebellious Tories came close last week to securing the 48 letters of no confidence needed to force an intraparty leadership challenge. If they succeed in securing that number, a leadership election will be called. It's widely expected that May would win. But if for whatever reason the vote count turns against her, it's likely she would resign. If she wins, her grip on power will be secure - Tories won't be able to call another no confidence vote for a year. But nothing material will have changed. Now we're starting to get into the more extreme possibilities. Only seven Tory turncoats would be needed to join with the opposition to call a general government-wide confidence vote. The Fixed Term Parliaments Act says that if the government loses a confidence vote in Parliament, it has 14 days to win one. If it doesn't, another general election must be held. That could take months. Members of May's government have said in the past that if they lost the Brexit vote, they could call a confidence vote. However, Brexiteers have said in response that, while they'd be happy to kill the draft Brexit plan, they wouldn't risk voting down the government. By rebelling against the government, turncoat Tories would risk being expelled from the party. Then again, the 10 DUP MPs who have repeatedly expressed their frustration with the deal could also bring down the government. The failure of May's government, and an ensuing general election, would likely mean chaos in markets as the 'uncertainty' that May often speaks about would be ratcheted up to absurd new heights. If Parliament can’t decide, then give the people another shot. May has repeatedly insisted that there won't be another referendum under any circumstances. But Wall Street has put the probability of a second referendum as high as 30%. Even if another referendum was called, it would take months to hold a vote. So the EU would need to extend Britain’s negotiating period. And Parliament would need to make certain considerations. If May's fractious Tory caucus can't get behind the deal, then 'no deal' it is. That would be a hard sell politically. The country is believed to be woefully unprepared for food and medicine shortages that economists have warned about. There has been talk of traffic jams in both the EU and UK as customs barriers rise. Then again, it's also possible that the pain would be transitory, and it would only create further incentive for both sides to hammer out a trade agreement, maybe one similar to the 'SuperCanada' deal that Brexiteers have been trying to sell. While members of May's cabinet, and May herself, have insisted that no deal won't happen, it's not clear how it would be prevented. Parliament doesn’t want No Deal, so let’s got for the closest possible relationship to the EU instead. Some Tories have been pushing this approach recently. However, as Open Europe points out, given the wording of the leaked political statement draft, a Norway-style trade agreement is unlikely. A leaked version of the declaration sets out a spectrum of possibilities for the future partnership, ranging from a “Canada-plus” comprehensive Free Trade Agreement, to what might be termed a “Chequers-minus” deal. Where the final agreement falls on this scale will depend broadly on how far the UK is willing to align with EU rules, and, correspondingly, how much it would accept in terms of level playing field obligations and an indirect role for the European Court of Justice. The text does not provide a clear path to a Norway-plus agreement, where the UK remains integrated in the four freedoms of the EU single market. It's also unlikely to garner the support among the Tories that would be needed to make it a suitable alternative to the current deal. There’s already legislation in play to call for a general election. But Tories are too fearful of relaxing their already tenuous grip on power and losing control to Labour. It's more likely that a general election would follow a vote of no confidence in the government. What many Americans don't realize about the Brexit situation is that there already is a comfortable majority in Parliament to support the deal - it's just spread between different parties. And Labour MPs who break ranks to back May's plan could risk expulsion from the party, as party leader Jeremy Corbyn has come out against it. Assuming 'no deal' is averted, negotiations over the future trade relationship between the EU and the UK would begin. Given the fraught nature of the Brexit treaty talks, this will almost certainly be another trainwreck requiring the squaring of many opposing interests. 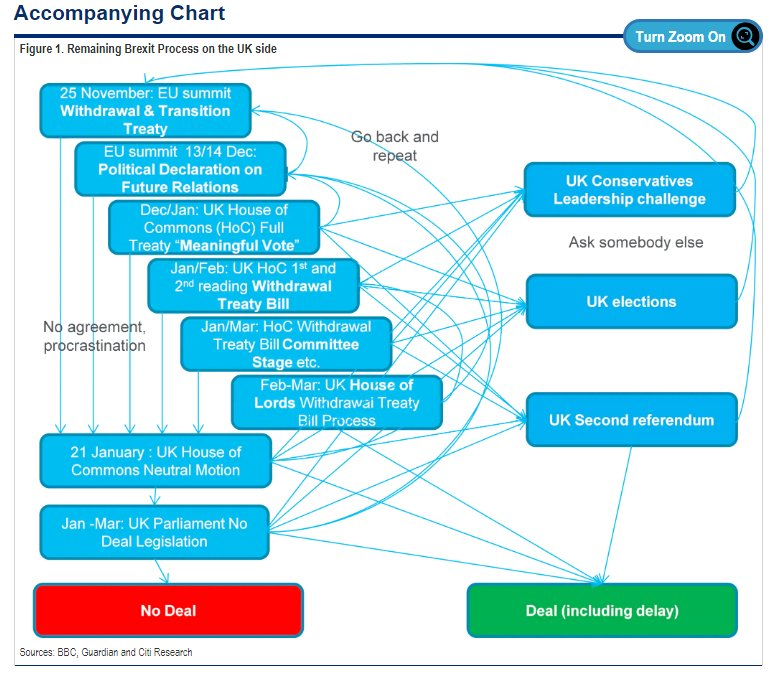 As it stands, here's a chart of some of the most likely scenarios for the future trade deal, compared with what the UK has now. The non-binding withdrawal agreement that's still being hammered out in Europe is supposed to set a framework for these negotiations. The 26-page document that leaked yesterday includes many stipulations, all of which are non-binding. Here's a rundown of the big points, courtesy of Open Europe. The upshot, is that the document envisions a strong free-trade relationship between the UK and the EU, but one that's far less integrated than what exists today.